Noise of Art starts it’s tenth year with a series of events in March, including a night on Monday 16 March at the Convergence Festival, Village Underground. As a part of Convergence and Noise of Art’s exploration of technology and art (and following-on from NOA’s sold out series of 100 years of electronic music shows in 2014), NOA returns with a theme that explores sound manipulation’s effect on contemporary music. To celebrate the origins of sound effects, where early recording studios were built with “natural” echo or reverb, Noise of Art is creating a series of Reverb effects chambers using unusual architectural locations, such as nuclear aircraft hangers on a disused US nuclear airforce base. Launching this new series at Convergence, Noise of Art has invited pioneering DJ and producer Andrew Weatherall to DJ using the Boom Room effects, alongside two launch sets from Rocket Girl acts Eats Light Becomes Light and White Noise Sound. Weatherall has been at the forefront of UK’s electronic scene since the late 1980s. A tireless innovator, and peerless producer and remixer, with a John Peel like passion for discovering music and sounds, he’s also one of the most imaginative DJs around. New Rocket Girl signing, Swansea’s six piece White Noise Sound, combine the hypnotic rock of Spacemen 3, with psychedelia, sonic loops and drones and indie dance floor sensibility. Tonight they launch their much anticipated new LP, Like A Pyramid of Fire, released in March 2015 on Rocket Girl. Neil Rudd’s boundary crossing project, Eat Lights Become Lights, joins the line up to debut their new live show. 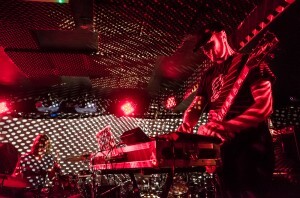 Their LP, Into Forever, released in spring 2014, pre-echoed much of the drone and looped based music that followed, containing both dance floor bombs and long, swelling ambient opus’s. Pioneering electronic musician Per Martinsen (aka Mental Overdrive) and Noise of Art founder Dj Ben Osborne, the creators of the Boom Room effects units, will be debuting new music specifically designed for the Boom Rooms. Noise of Art has partnered with Vinita Joshi and her Rocket Girl label for this event. Long term champions of off centre music, Rocket Girl has consistently supported quality acts too often ignored by the mainstream. Created by pioneering Norwegian electronic artist Mental Overdrive and Noise of Art’s Ben Osborne, the “natural” echo chambers being used tonight will be linked over broadband to Village Underground and used live to manipulate the music being played. Sound effects and the manipulation of recorded music have been at the heart of modern music since Sam Philips first added echo to Elvis’ vocals and Pierre Schaeffer and Pierre Henry used magnetic tape to turn industrial sounds into music. Early recordings effects were created architecturally – with some recording studios being purposely designed with “natural” reverb, to help recordings sound closer to the real thing. Noise of Art’s 2015 project uses new technology to go back to these roots, linking the music made in the venue over broadband to distant echo chambers in unusual places, such as the abandoned bunkers of a nuclear airforce base on Britain’s east coast. To help create these effects chambers, Noise of Art has partnered with The Old Jet studio, a new state of the art recording and tour rehearsal studio set up by Jesse Quin (Keane). 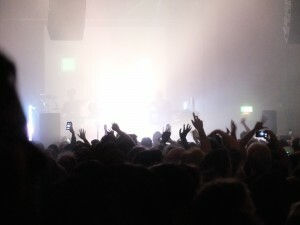 The acts selected to play come from a range of genres, but all have a connected interest in the core of early electronic music’s use of loops and drones. Additions to the line up and further events to be announced soon. 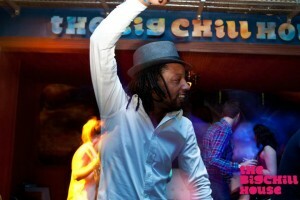 Events at Big Chill Bar, 93 Feet East in Brick Lane and The Riverside in Woodbridge. Noise of Art’s sister club session, Slipped Disco, and Trans Europe Express are holding events in London’s Brick Lane, while the Woodbridge Art & Music Event has spawned a new night at The Riverside on the banks of the River Deben at the beginning of September. 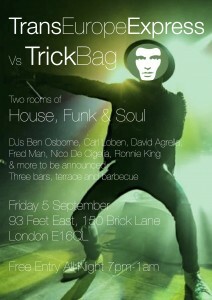 The following week will see Trans Europe Express team up with funk night Trick Bag (who’re running two nights on Thursday 4 and Friday 5 September at 93 Feet East), to present two rooms of high calibre house and funk ‘n’ soul on Friday 5 September. Finally, the successful Woodbridge Art and Music event is being followed up by the first ever club night at cinema, restaurant and Theatre complex, The Riverside, on the banks of the River Deben on Saturday 6 September. Featuring innovative acts from a broad range of musical genres, Woodbridge Art and Music Event is an independent happening, set in a riverside market town, opposite the Sutton Hoo Anglo Saxon burial ship. The daytime events will take place in the award winning Elmhurst Park, while evening events will be held in several venues around the town. Entry to the event is with a wristband. Acts announced so far include Red Snapper, The Reflex, Polar Bear, Severino (Horse Meat Disco), TY, The Woodentops, Justin Robertson, Si Begg, Ben Osborne, Noise of Art, The Intermission Project, Thomas J Spieght, Ben Hauke, Oculus, Swallow and The Wolf, Charlie Law, Kevin Pearce, Rhiannon Mair, Aartwerk, Jan Pulsford and Robert Castellani, BBC Introducing in Suffolk, Blue Bus Tour, Non Such DJs, Talulah Goodtimes, Ben Allen, U2R, Planet Patrol, plus art installations and exhibitions and plenty more to be announced. Saturday 9 August and Sunday 10 August. Having launched Trans Europe Express with a French theme in June, the crew behind TEE return with a distinctly Nordic feel, as Norwegian label Love OD flies into London. Norways wonderKid Kohib (Beatservice Records // Cibicaldo Recods) has just released his third EP, “La Grave” for Beatservice Records and has, justifiably, been getting the support from tastemakers and DJs across the world. Currently working on an album, his recent remix of Volta Cab, on Lost Paradise, has been garnering heavy club rotation, as has his Sony released Henrik Schwartz collaboration. Often cited as the father of the Norwegian electronic scene, Mental Overdrive’s joins us to celebrate his single on Love OD, which features remixes by Full Pupp’s Daniel Blackbelt Andersen and Optimo’s JD Twitch. For those interested in the interplay between music and film, the event is taking place in the run up to the East End Film Festival, where Mental Overdrive’s film ‘Monster’ is being given its London debut on 21 July. With more to be announced, the night features rotating resident DJs from Italy, France and the UK, with Horse Meat Disco’s Severino, Noise of Art’s Ben Osborne, Gucci Thump’s Nico De Ciglia and Sketch’s Mathieu Maddisson taking it in turns behind the decks. The debut Woodbridge Art and Music Event takes place on Saturday 9 August and Sunday 10 August in the medieval market town of Woodbridge, Suffolk, opposite ancient Sutton Hoo. 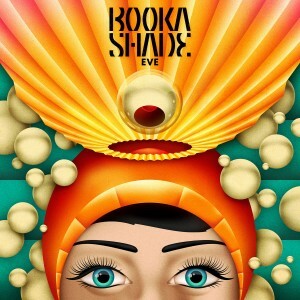 Situated next to a tidal river, one hour and thirty minutes from London, the event features a line-up of innovative acts representing a diverse range of music – including electronic, jazz, indie rock, funk, folk, disco, house, electro and more. Acts announced so far include: Red Snapper, TY, Polar Bear, The Reflex, Severino (Horse Meat Disco), The Woodentops, Justin Robertson, Si Begg, Ben Osborne, Noise of Art, The Intermission Project, Thomas J Spieght, Ben Hauke, Blue Bus Tour, Kevin Pearce, Rhiannon Mair, Artwerk, Jan Pulsford, Non Such DJs, Talulah Goodtimes, Ben Allen, Oculus, Swallow and The Wolf, Charlie Law, U2R and Robert Castellani, plus art installations and exhibitions and more to be announced. TEE, a new monthly platform for European music, launches in London on Friday 6 June with live guests Griefjoy (Nice), Cleo T (Paris) and Ben Hauke (London) plus guest DJs David Agrella (Italy) and Craig Allison (UK). Resident DJs (on rotation) include Noise of Art’s Ben Osborne (UK), Nico de Ceglia (Italy), Mathieu Maddesson (France) and Severino (Italy). 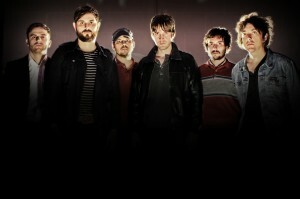 Having taken Liverpool Sound City festival by storm, Griefjoy return for their second London gig. Their sound combines rock intensity with the heart tugging emotion of A Reminiscent Drive and the pure dance floor energy of Justice. Their only other London gig to date sold-out the Lexington. Fast rising Parisian electro chanteuse Cleo T first started turning heads when she won Paris’ Young Talent contest in 2012. 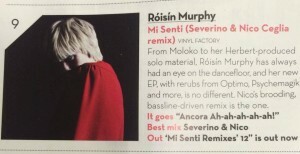 Since then she’s formed a band and recorded her debut LP ‘Songs of Gold & Shadow’ with producer John Parish. She went down a storm at this years The Great Escape festival. New signing to Chris Coco’s Melodica imprint, Ben Hauke is an 18-year-old master of live sample looping, creating one-off live re-cuts on vintage samplers that repurpose everything from found sounds to jazz, classical music, hip hop and electro. Taking place throughout 93 Feet East’s live room, DJ bar and courtyard terrace, the night is being run in partnership with Oui Love and the French Music Export Office in London. 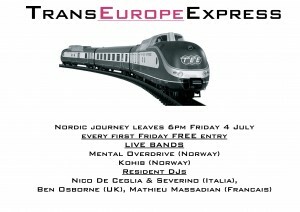 Friday 4 July with Mental Overdrive (Norway) Bosca (Berlin) and more to be announced. 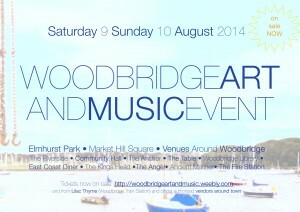 Friday 1 August, Woodbridge Art and Music Event launch party.